Forget about those fat filled breakfast sandwiches and greasy biscuit and bacon concoctions, Starbuck's has a healthier alternative. 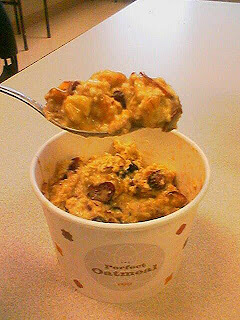 Oatmeal! Mix-ins include dried fruit, nuts and brown sugar. I had all three and the oatmeal was better than anything I've come up with at home from scratch or out of an envelope. The price is about the same as a breakfast sandwich anywhere else but this is one fast food meal you won't have to feel guilty about. I received a coupon for a free oatmeal in the mail. I tried it with the dried fruit and brown sugar. Maybe it was the store I went to but it really had the texture of instant oatmeal. I don't mind instant oatmeal I have it all the time because I've never mastered making it myself. However, when I eat out and order Oatmeal I really would like homemade...it tastes much better and feels like a real treat. I don't think I will purchasing this very often...maybe in a pinch.